Concepción market, situated between Calle Aragón and Calle Valencia, is over 125 years old – though you wouldn’t know it as it has been thoroughly modernized. 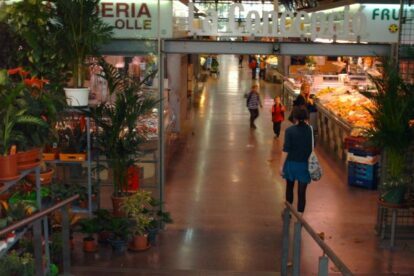 As well as housing a range of excellent cheese, fish, fruit, meat, veg and deli stalls, the market also has: 3 bars; a 24 hour florists (yep – flowers 24 hours a day, 365 days of the year); a large Caprabo supermarket; an electrical appliance store (selling freezers, pcs, washing-machines etc); an underground car-park, and, very interestingly, a well-organized book-crossing point with titles in English, French and German as well as Catalan and Spanish. If you spend more than € 10 at any stall you can claim a free car-park ticket. The market also hosts regular events such as tasting sessions during which you can try regional products, and cookery workshops for kids. Well worth a visit if you like good food and want to avoid the crowded La Boqueria market on the Ramblas.